Just a few lines to you all in Hethersett; hoping these will find you all in good health as it leaves me at present. We are having a trying time just at the present. Everywhere is so wet and muddy and there is nowhere to sleep only out in the wet when we are in the trenches. Sir, I am sending you this letter in answer to a parcel which I received on the 21st December – a pair of socks, four packets of Woodbines and a Christmas card from the friends of Hethersett, and I am asking you to thank the people who sent them, which I thought you sent if not I thought you would know. Give my best respects to yourself and your wife, Mrs Sharman and to George and Walter and all those on the farm. Hoping you and all in Hethersett will have a Happy Christmas and a prosperous new year. I am your obedient servant doing his country’s duty as a soldier and a man. The Parish Magazine was also the source of a remarkable story about a Hethersett soldier injured at the notorious Battle of Mons. 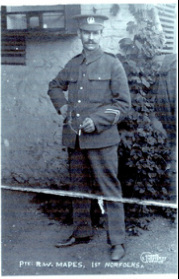 Somehow Private R. W Mapes made his way back to the village where residents had assumed that he had died. The article runs as follows. No small stir and excitement was caused in the parish on the morning of June 18th when news arrived that Pte R. W. Mapes of whom nothing had been heard since September 19th last had arrived safely back in England and was returning home that afternoon. Mapes was wounded in the retreat from Mons and after a number of exciting adventures was placed in a hospital from which he escaped after a few days with six comrades. He was fortunate in finding friends who gave them a hiding place and refreshment and with whom he was obliged to remain for seven months. After several attempts to escape, which involved great risk, he finally got away and reached England on June 15th. We heartily congratulate him not only on his success but also on his pluck and determination and at the same time rejoice with his mother and relatives that their long and tense anxiety has come to such a happy ending. NOTE: Apparently Pte Mapes' escape was made possible with help from Edith Cavell. His name appeared much to his surprise on the village Roll of Honour. Just a line to tell you that I am still alive and well and to tell you I received a parcel from Hethersett Friends this morning - a nice warm undershirt and Christmas card, who, if you know who they are I hope you will thank them for me. Young Thurston got one too.... Just buck up the boys about there. I have not heard from anyone yet... Want some warm clothing... It is very cold here. Most of the rest of the letter was either destroyed or erased by the censor. The parishioners of Hethersett replied so splendidly to my appeal for scarves for the 4th Norfolk Regiment, and worked so hard to make them, that if you can find room in your Parish Magazine I should like to thank all those who so readily knitted them for me. I am pleased to say I have now had 500 scarves sent me, of which 400 have been dispatched to Suvla Bay, Gallipoli, and I have enough to distribute to the draft of men who are very shortly joining the Regiment overseas. I am sure that when the scarves are received they will be a real comfort to the men who are having a terrible time in the Peninsula; and I am sure when all those who knitted them realise that the scarves are being worn by our men 3,000 miles away, they will be glad to think their work is providing a comfort to some of our soldiers. I am only sorry not to have time to write a personal letter of thanks to all those who did so much to help me.